It is easy to think of "democracy" only in terms of the big things: a political system, all of our government officials, an enormous bureaucracy which often seems removed and slow-moving. But, it is also the small steps. Democracy is a reflection of the choices we each make daily about how we will interact with each other. For years, Facing History teachers have used a reading which shows this - an essay originally written by Jesus Colon as he reflected on a small moment in his own life, when stereotypes and societal expectations played a large role in the choice he made about interacting with others. His reflection provides an opportunity for all of us to think about the small opportunities for interaction presented by living in a democracy. 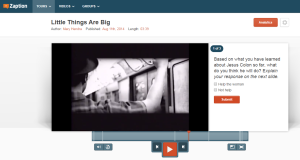 We now have a high tech version of this lesson, thanks to a collaboration with Zaption. Do you teach in a "flipped" environment? Do you ever wish you could have students watch short videos at home without entirely losing the great engagement you get in the classroom? Zaption helps teachers keep interactivity instead of having students passively watch a video (and likely try to multitask). Facing History decided to try it out with some of our core lessons, including "Little Things Are Big." We'd love to know what you think! 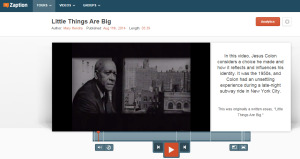 As the video progresses, notes, questions, and other elements pop out on the right side, stopping the video while the student responds so that they don't miss the next part. Some elements are just for the student. Others show the responses previously entered - an asynchronous discussion. As the teacher, you can see analytics which include who watched how much and what answers they shared. Check out the tour here. Then, let us know what you think! We'd love to hear if you already use Zaption, are thinking about using it, would like additional Facing History Zaption tours, or any other feedback. Want to see more of our Zaption tours? Get more ideas for flipped teaching on our sister blog, Interfacing. This lesson comes from Choices in Little Rock, a teaching unit that focuses on efforts to desegregate Central High School in Little Rock, Arkansas, in 1957. The unit explores civic choices--the decisions people make as citizens in a democracy. Those decisions, both then and now, reveal that democracy is not a product but a work in progress, a work that is shaped by the choices that we make about ourselves and others. Click here to download the Choices in Little Rock curriculum. Click here to register for the online course on Choices in Little Rock, beginning October 9th.